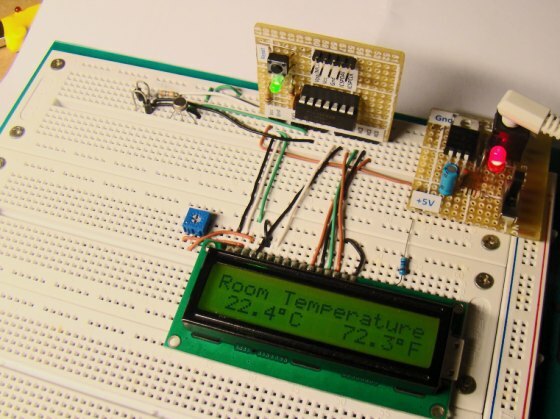 A digital thermometer is a good choice of project for beginners who just stepped in to the world of microcontrollers because it provides an opportunity to learn using sensors to measure the real world signals that are analog in nature. 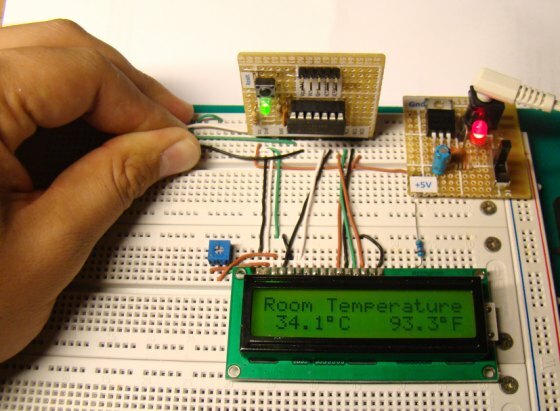 This article describes a similar project based on a PIC16F688 microcontroller and an LM35 temperature sensor. LM35 is an analog sensor that converts the surrounding temperature to a proportional analog voltage. 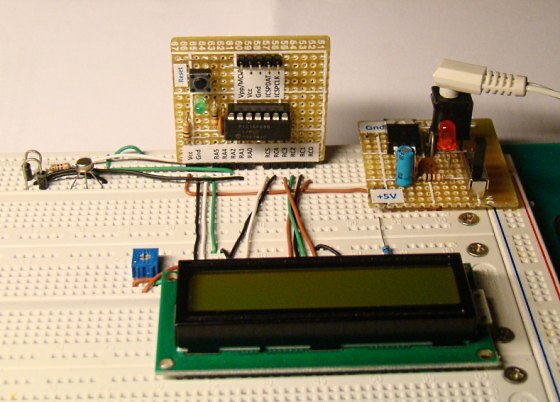 The output from the sensor is connected to one of the ADC channel inputs of the PIC16F688 microcontroller to derive the equivalent temperature value in digital format. The computed temperature is displayed in a 16×2 character LCD, in both °C and °F scales. The LM35 series of temperature sensors are produced by National Semiconductor Corporation and are rated to operate over a -55 °C to 150°C temperature range. These sensors do not require any external calibration and the output voltage is proportional to the temperature. The scale factor for temperature to voltage conversion is 10 mV per °C. The LM35 series sensors come in different packages. 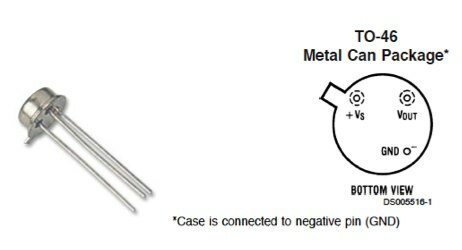 The one I used is in a hermatic TO-46 transistor package where the metal case is connected to the negative pin (Gnd). The measurement of negative temperatures (below 0°C) requires a negative voltage source. However, this project does not use any negative voltage source, and therefore will demonstrate the use of sensor for measuring temperatures above 0°C (up to 100°C). The output voltage from the sensor is converted to a 10-bit digital number using the internal ADC of the PIC16F688. Since the voltage to be measured by the ADC ranges from 0 to 1.0V (that corresponds to maximum temperature range, 100 °C), the ADC requires a lower reference voltage (instead of the supply voltage Vdd = 5V) for A/D conversion in order to get better accuracy. The lower reference voltage can be provided using a Zener diode, a resistor network, or sometime just simple diodes. 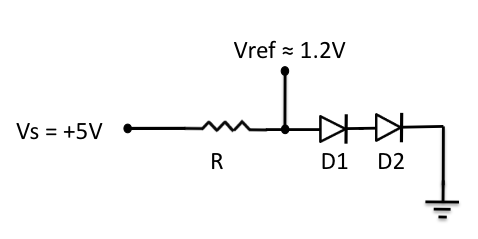 You can derive an approximate 1.2V reference voltage by connecting two diodes and a resistor in series across the supply voltage, as shown below. As a demonstration, I am going to use this circuit in this project. I measured the output voltage across the two diodes as 1.196 V. The resistor R I used is of 3.6K, but you can use 1K too. The important thing is to measure the voltage across the two diodes as accurate as possible. We need do some math for A/D conversion. Our Vref is 1.196 V, and the ADC is 10-bit. So, any input voltage from 0-1.196 will be mapped to a digital number between 0-1023. The resolution of ADC is 1.196/1024 = 0.001168 V/Count. Therefore, the digital output corresponding to any input voltage Vin = Vin/0.001168. Now, lets see how to get the temperature back from this whole process of converting sensor’s output to 10-bit digital number. While displaying this, you need to put a decimal at the fourth place from the left. So the calculated temperature is 26.3968°C, which is pretty close to the actual one. The difference is caused by quantization and rounding errors. In this project, we will display temperature accurate to one decimal place, i.e., we will divide the above number by 1000 to get 263. So the temperature will be displayed as 26.3 °C. 79.34 °F is equivalent to 26.3 °C. In this project, it will be displayed as 79.3 °F. An external reference voltage to the internal ADC of PIC16F688 can be provided through RA1 I/O pin. The output from the LM35 sensor is read through RA2/AN2 ADC channel. The temperature is displayed on a 16×2 character LCD that is operating in the 4-bit mode. A 5K potentiometer is used to adjust the contrast level on the display. The detail circuit diagram is given below. Note that the PIC16F688 uses its internal clock at 4.0 MHz. A closer look at the LM35DH sensor and the reference voltage circuit. I took some pictures of the completed project displaying temperatures in both the scales. The accuracy of the temperature measurement highly depends upon the stability of the reference voltage. If the reference voltage drifts from the value that we considered in our calculation, the measured temperature value could be significantly off from the actual value. 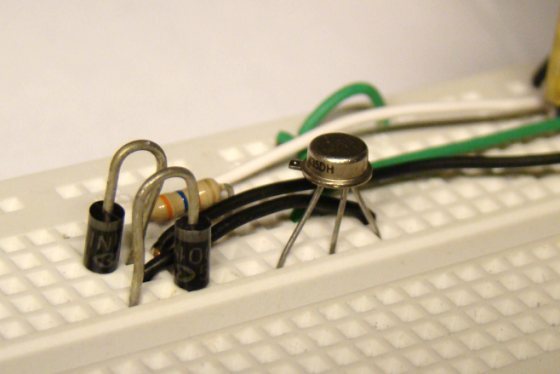 Using a simple diode-resistor network for deriving a reference voltage may not be a very good idea, but the purpose of this project was to demonstrate the technique, not to come up with a commercial digital thermometer product. You can also try a Zener diode or a potentiometer to derive the reference voltage. Besides, the quantization error introduced by the 10-bit ADC, rounding numbers while doing the math, and the accuracy of the sensor itself within the desired range of temperature also affect the measurement output. Read the manufacturer’s datasheet for more details on the performance of the LM35 series sensor. This design has a little flaw. It uses a voltage drop across two diodes (? 1.2 V) as a reference voltage (Vref) for A/D conversion. However, the datasheet of PIC16F688 suggests to use Vref greater than 2.2 V to ensure 1-LSB accuracy in the A/D conversion. Therefore, I have re-written this project but this time using a MCP1525 device for creating a precise 2.5 V reference voltage. The new design is more precise and accurate in taking temperature measurements. Read “Revised version of LM35 based digital thermometer“. I want to do this project with a little modification.I want to measure water temperature,along with air temperature using the same setup. Can u tell me which type of sensor is good for measuring water temperature? I’m no expert in electronics, so please help me out, where is the power supply connected? hi i want to design temperature measurement wireless sender and receiver circuits with infrared using lm35 sensor with avr microcotroller . please help me and show me circuit diagram and how to programming. Please can you give me the C code for this project? am using PIC18F4520. i need to write aclculation using thse two inputs and the result needs to be displayed and using a DAC need to out put in 4-20mA output. hey can i have the source code as well please? Here in this article in comment section you mentioned that “Yes, you are right. It won’t measure above 120 degree C. Thank you for the correction.”, what should be done to measure more than 120 deg, why it is linked with 1.2 voltage reference. 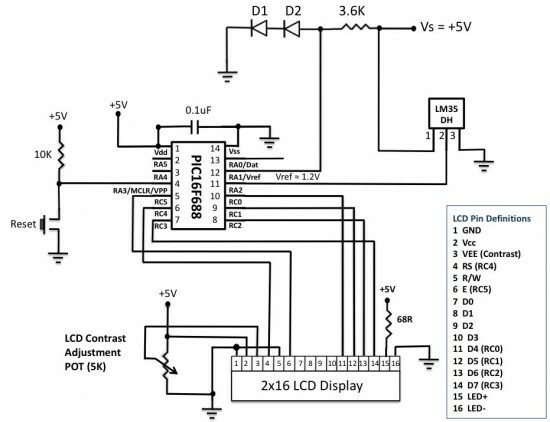 can you please tell me where can i buy this lcd display; lm 35 sensor and what kindey of diodes you use and them marks. What about 4 diodes in a series. It would make Vref 2.4V which is near from 2.2 VRef recommanded by the datasheet. i am working on a pic microcontroller based room temperature measurement project. i tried to compile my code but i gave the error “demo limit”. can someone out there help me to compile the code to hex file if i send it out. What is the purpose of the resistor here? What if you select vdd as voltage reference?? Where did you get the 1.2v ref?? how did you know that it took 1.2v ref? Voltage across two forward biased diodes is approx. 1.2V. You can try it yourself. i wanna put a red n green led into condition of that temperature.instant of when temperature less than 23 degree and more than 28 degree celcius, led red is blinking and it’s as indicator for user taking a action.other that the range led green is on and it’s condition is good. i’m tried to put any if else condition,but it still has error..can u help me instant of a coding..? Hi R-B! I got 119 o C is it normal? what did i miss? what suite of mplab do you use? The code written here is in mikroC compiler. Same comment I left for the LM34DZ…There needs to be a resistor on the output to get the full range of measurement, otherwise you lose the ability to measure the low end. can u list down all the equipment that needed in this project, pls? But when PICKit2 connection with the circuit, the PICKIT2 does not recognize device (PIC16F688). But when I not connect the voltage Vref PICKit2 then PICKIT2 OK. The code for LCD is inside mikro C pro. Go to help and type LCD, you will get the initialization command for it. i coudn´t find code for LCD Initialization in the code. how did you did it? LCD initialization is done by Lcd_Init() function. It is a built-in routine of mikroC Pro for PIC compiler. please could you kindly supply the circuit diagram of the new Vref = 5V and Vout through a non-inverting op-amp circuit and also what will be the calculations for finding the temperature?? please help thanks alot! Did u check diode polarity? Did u check diodes polarity? Hello R-B, thanks for the excellent project! I mounted the circuit and coding exaclty as in your website, however, I have the following problem: The ADC is reading fine however the Vref pin seems not working, I change the values and nothing happen. The most funny is that when I use the HEX file that you attached in the website, it works perfect. it is my final year project.I made the circuit as you have been made.But,the output of LCD display is not show.I used only LM35DZ instead of LM35DZ.The other thing is not changed. What do you mean by ‘LM35DZ instead of LM35DZ’? and i would suggest this website which is may usefull to others http://www.cytron.com.my. In this crt, used 1N914 (maximun voltage is 100V). If u r using 5V, look for maximun voltage that comes with voltage references. U can used any specs of LCD with or w/out backlight such as 8×1, 16×1, 16×2 or 16×4, 20×1 or 20×2 or 20×4, or even 128×64 with or w/out touchscreen, etc. The max of LCD is 4 lines. 2) u can write ur own eepromn that comes with pic. 3) u can buy ePIC-KIT2 ISP Programmer & Debugger, but it is not clone. Yes, it is compatible with pic16F and pic18F ONLY. U can’t buy ICD2 clone such as pick2 clone. it will not work even if it is made in china. But u can get original made in china, But very expensive. 5) Yes, u can his(RB)hex file. In Mplab, that do for u so u get asm, mikroC, mikroBasic, pascal. If ur LCD comes with 16 pins w/out backlight, disconnected pin 15 and 16. Also check solder bridge between pin to pin. If the LCD shows all dark boxes, it means the display is not initialized. Either your circuit is not correct or the microcontroller is not running. Check the circuit carefully. I rewired everything as showing above including didoes and resistor. And i got same result. The temperature is still fluctuated. Vref on RA1 is 0.28V. I went thru google search and said it wouldn’t work with pic16f887 also can’t work with external. I will have to switch to pic16F877 or pic18F4525 or dspic30F604013. If not i will move on to mmx7. While I powered up. The temperature is changing fluctuated up and down. I got exactly room temperature 23 to 29C. How do i get Fixed temperature? Is your room temperature stable? What is your reference voltage for A/D conversion? How can I tell you what’s wrong with the code if you don’t show me your circuit diagram? And even the program you sent is not complete. What type of variables are tempinC and tempinF (float, int, long)? Send me these details at admin (at) embedded-lab.com so that I can answer your questions. Thanks. I’m using pic16F887, but w/out using didoes D1 and D2 and 3.6K ohms. And I got room temperature 0.0c and 32.0F. Do u think i should add didoes and 3.6k ohms? It depends on what reference voltage are you using for A/D conversion. The diodes and the resistor in my circuit provides an external reference voltage of 1.2 V.
Thanks for the clarification RB. Great job! what happen if i used the internal 5v ref & excluding the 1.2v external vref? As i only have some mcp9700 which max output is 1.7v. Whats the max temperature i can get with 1.7v? You can use +5 V as reference for A/D conversion of signal from MCP9700. It will decrease the resolution of ADC as the maximum input voltage to ADC channel is far less than +5 V. But that would work. You will be able measure the entire range of the temperature that could be measured by MCP9700. sir,i hav not tried anything on designing and placing of components on a board but this project is my first so sir,how do i go about designing this particular project as a beginner. it is my first time of visiting this site nevertheless,this work is very impressive.this is actually what i am working on as my final year project.i would appreciate if you guys could send me materials on how to lay components on PCB.More grace to your elbow. Thanks for posting a nice blog like this. It is a great project to do, with those instructions having the photos it’ll be a help for those beginners on this field of work. 1.also, can you tell me what particular specs of LCD should i buy? 2.Can you also add a feature of logging temp. data on its own circuit and retrievable later from the PC? 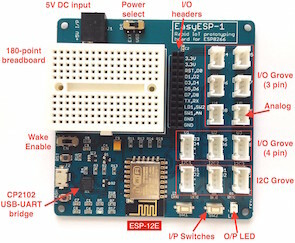 or “PIC In-Circuit Debugger and Programmer (ICD2 Clone)” from the website http://www.e-gizmo.com/KIT/ePIC-KIT2.htm, is it compatible in this project? 4. what is the advantages and disadvantages of these two? many programmer kits are confusing me. 5. can i use your Hex file and also download MPLAB with this kit? Hi, i haven’t done any PIC project yet, but I’m reading tutorial lessons now. however as much as i would like to do the project, i am also hesitant because as i read the readers’ comments, this particular project suggests for a modification particularly for the reference voltage. can somebody provide a revised version, please? 1. i can program the circuit to send a positive signal for a relay when the temperature reaches above 30 and below 15 degrees centigrade. Hi, would you please be able to tell me what diodes you used to get the reference voltage? I’m a little confused about how to derive a suitable reference voltage using the two diodes. These are just normal Silicon diodes that have forward biased voltage of approximately 0.6 V. But I won’t recommend doing this as I realized later that the Vref for PIC16F688 must be over 2 V (read other comments). I would rather suggest to use Vref = 5 V and amplify the LM35 output with a non-inverting Op-amp circuit. where do i get the details of the project to start developing it. i try to check for more information about the project to try building it myself but basically i can only view the theory and introduction… can u help me with its detail like the programming, the list of components and some guides to building the project. thanks for the post. You use a Vref+ of 1,2V, but the datasheet says the 16f688 can only use a minimum Vref+ of 2V. How did you solve this problem? The PIC16F688 data sheet (pg.155) says to ensure 10b accuracy Vref must be at least 2.5V. I missed that part, thank you for pointing this. This is another limitation of this project. But if you increase Vref to 2.5 V, the resolution of ADC will go down (means more uncertainty in the measurement) as the output from LM35 sensor can swing only up to 1.5 V. One solution could be to use an active device to scale the output voltage from the LM35 sensor, but that will add further complexity. When the above C code is compiled with MikroC, an equivalent assembly code is generated. You can see the assembly code by clicking on View Assembly from the Project menu. Congratulations for the superb projects. I need the same coding done in Assembly language. any assistance. Yes, you are right. It won’t measure above 120 degree C. Thank you for the correction. If I’m not mistaken, with a 1.2 vdc reference we have up to 120 degrees Celsius, correct me if I’m wrong. Congratulations with this site, keep up the good work. I like the way you documents your projects! Keep up the good work. Thanks for pointing that. I corrected it now.